The most common fear of every leader, innovator, and instigator is fear of finishing. It may sound counterintuitive – after all, these are the people who start things, who lead, who create change – but their fear is very real. Every instigator experiences this same fear. From the moment he begins, through every setback and project-halting mistake, to the gut-checking ship date, fear of finishing plagues every step along the path of a worthwhile endeavor. Every leader wonders whether his work is good enough. Every leader wonders how the tribe will react. Every leader wonders whether he’ll be jeered and criticized (or worse, laughed at). This (naturally) leads to thoughts of scrapping the project entirely, procrastinating in the name of perfection, and avoiding the publish button at all costs. Every one of these reactions is merely a way to avoid finishing, avoid shipping, and, ultimately, to avoid the pain of standing out. There is no angry group of critics waiting to dis your product. There are no mobs of people waiting to judge you when you publish. So stop worrying about this imaginary group of people watching you. Don’t stress about negative reactions to your product (note: more than likely they simply won’t notice). All you have control over is your work. p.s. I’ll be heading to the Seth Godin seminar this weekend in New York (hence the picture of his books above, conveniently placed next to my limited edition business card 🙂 ). I’ll take copious notes and hope to meet some incredible people. If you’re going, drop me a line. If you’re not, what question would you like to ask Seth, if you could ask anything? Share your questions (and thoughts) in the comments below. p.p.s If you haven’t had a chance yet, sign up to get incredible content sent directly to your inbox every Monday, Wednesday and Friday. Join the resistance! Click the image below! 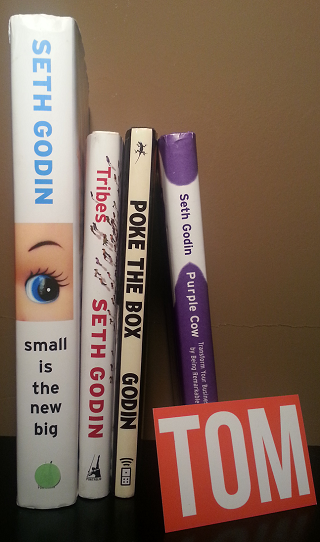 Super jealous you’re going to Seth Godin’s Conference! I can’t wait to read the content you produce when you get back!